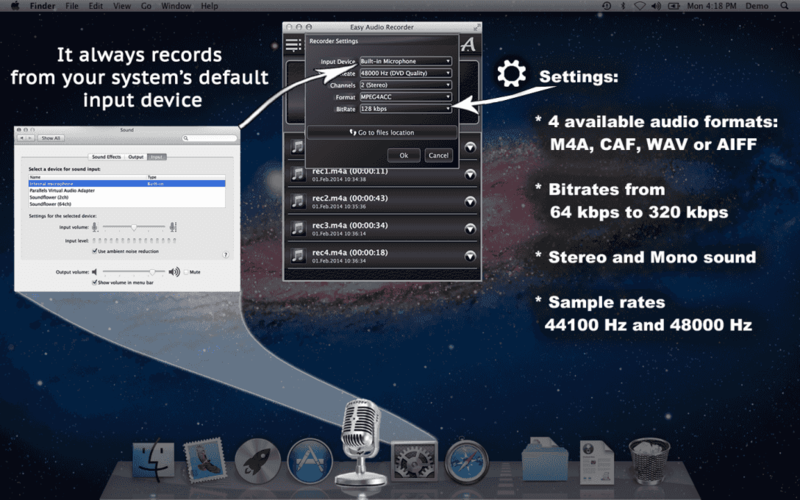 Record your voice, music and podcasts on your Mac. Do you like recording music? Podcasts? Maybe you need to record a speech or tell a story in your own voice? Easy Audio Recorder is really easy to use, and it will help you produce a high-quality audio recording on your computer. Go ahead, set up that portable music studio, record your podcasts and audio lectures, and experiment with multiple audio formats and customizable settings this app has to offer! 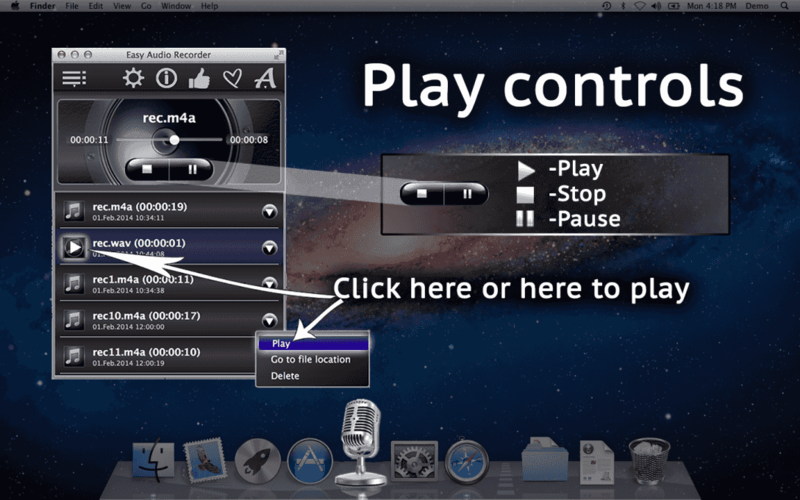 • Recording controls: Record, Pause, Stop, Stop & Skip buttons. • Play controls: Play, Pause and Stop buttons. The Play button on the right side has a drop-down menu with more options. • Audio input device. Unless you customize this option, the app will use a default audio input device (e. g. Built-in Input), For instructions on how to switch to a different audio input device, go to Settings and click on “Built-In Input”, or watch our short video tutorial. • Sample rate: 44100 Hz (CD Quality) or 4800 Hz (DVD quality). • Channels: 1 (mono) and 2 (stereo). • Available audio formats: MPEG4ACC, CAF, WAV and AIFF. • Bit rate: 64-320 kbps. 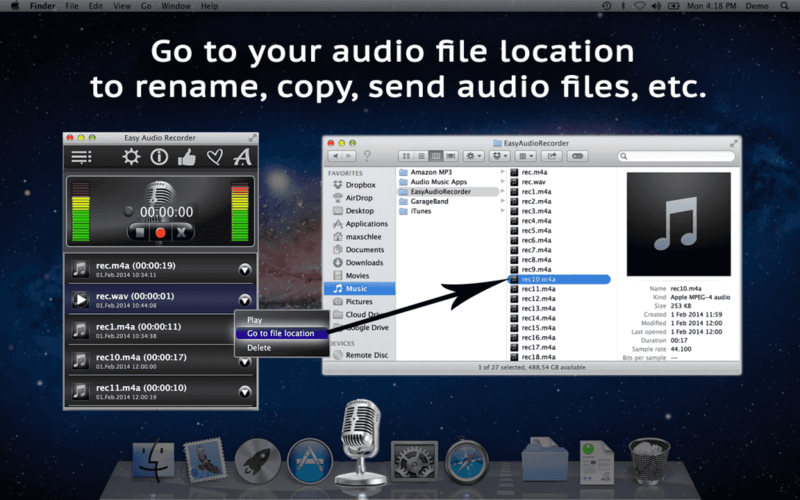 With Easy Audio Recorder, you can easily record music or audio tracks, listen to them, rename them, copy them, send them. If, for some reason, you don’t like the way your file turned out, you can move it to Trash. This way, if you should change your mind about it, not all is lost! So, what are you waiting for? Download Easy Audio Recorder today and enjoy all it has to offer! 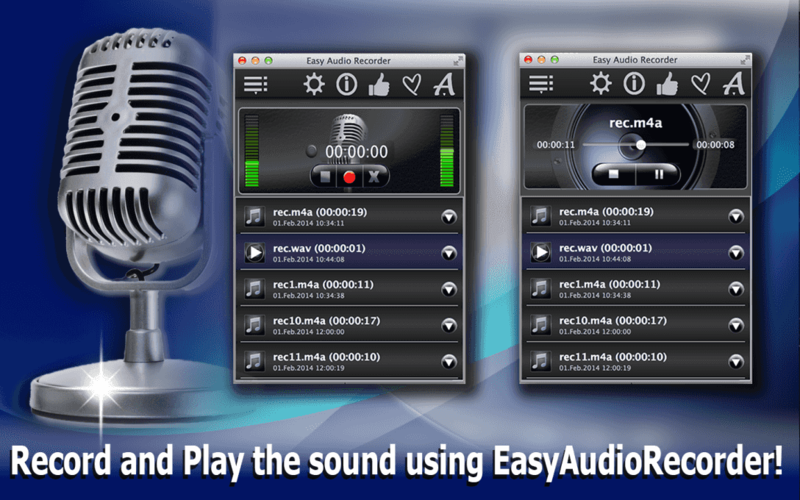 Try our FREE version of Easy Audio Recorder Lite! Hello and welcome to Easy Audio Recorder! This app helps you record audio files on your computer, and it is very easy to use. 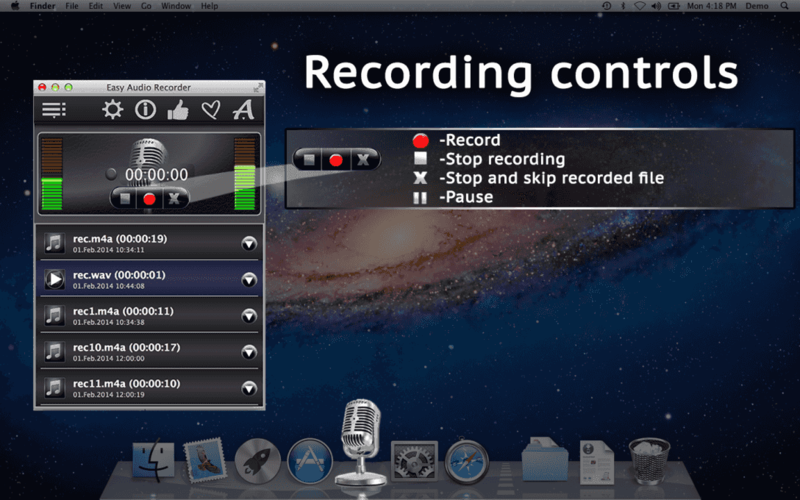 It has recording controls: the red “Record” button, a Pause button, Stop and Stop and Skip recording. It has Play controls: Stop, Pause and multiple Play buttons. This one has more options, such as Go to File Location and Move to Trash. Now, to the Settings. Unless you change your default audio input device, the app will always record your audio files using Built-in input. If you would like to change it, this is how you do it. Go to System Preferences, click on Sound and then select your audio input device. These are your other customizable options: Sample Rate, Channels, Available Audio Formats and Bit Rate. If you would like to rename, copy or send your audio file, click Go To File Location. We can get there from Settings or from the Play button on the right. If you don’t like the way your file turned out, you can move it to Trash. This way, if you happen to change your mind later, you will still be able to access it. And now, ready, set, start recording! • The “Move to Trash” option instead of permanently deleting files. • Resolved the issue of handling/backing up audio files in emergency cases (e.g. per outage, errors due to unknown reasons). • All recorded files are sorted chronologically, from the newest to the oldest. • Improved “Share” and “Like/Join Us” functionality. • Bright green “Today” labels highlighting the files recorded on that day. • Small GUI changes and a cross promo. In the current version there are no shortcuts for record, play and stop. We’ll implement this in the next update of EasyAudioRecorder. it depends on which input audio source was selected for the recording. To be able to record something without “background noises in the room” you need to use Soundflower as audio input, but not the internal microphone. What Codec does the CAF file use? I attempted to use some sounds I recorded as CAF and it crashes the application while trying to decode the CAF file. The AIFF file format functions without an issue. I’m trying to figure out if this is a Codec issue or some other SWIFT IOS bug. “Easy Audio Recorder” uses for CAF and other audio formats AVFoundation framework (class AVAudioRecorder). The implementation is done in Objective-C. The same frame work is available on iOS too, try to check as first your SWIFT implementation. I am using the lite version and I would like to purchase the full version. I do not find information about the ability of VOR (Voice Operating Recording). The VOR (Voice Operation Recording) is not a part of “Easy Audio Recorder”. But it is a very good idea for the next update of the app. I am recording music from directly from wimp, but the quality is not good. It sounds like there is no base. What can I do to improve the quality of the sound? You need the audio editing software, something like audacity or any player with equaliser possibilities. Can the Easy Audio Recorder be used with iMic by Griffin Technology as its input device? I’m hoping to use it to record and archive some old cassette tapes. if iMic device is available in the Mac System Preference=>Sound=>Input than you can use it. But make sure that iMic is set as default input device before you start the Easy Audio Recorder. I just downloaded the lite version. Seems like a straightforward recording app. I need a simple to open. simple to control recorder for location recording. My question: in the “full” app, can I specify where the file will be recorded BEFORE I record? I record huge files and need to use an external drive. we plan to implement the possibility to change the location for the recording in the next updates for both the Lite and the Full versions of “Easy Audio Recorder” as well.